Assembled Length: 6.5 in. 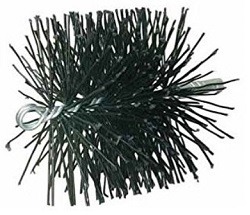 Product Type: Chimney Brush Bristle Material: Polypropylene Assembled Width: 6.5 in. Brush Shape: Round Color Family: Black Application: Chimney Cleaning Kit Assembly Required: No Assembled Height: 10.75 in. Hardware Included: No Packaging Type: Box Designed for insulated metal chimneys, stainless steel or metal stove pipe where manufactures recommend not scratching the flue. 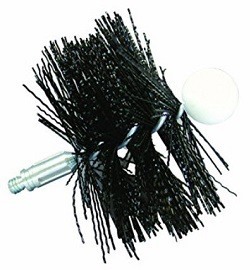 Sturdy plastic brushes have 6" of fill and are acid resistant. Fittings are 1/4" threading. Designed for insulated metal chimneys, stainless steel or metal stove pipe where manufactures recommend not scratching the flue. Sturdy plastic brushes have 6" of fill and are acid resistant. Fittings are 1/4" threading. 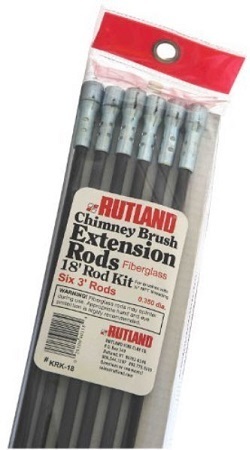 The Gardus Soot Eater Chimney Rod 2-Pack extension rod kit works with the RCH205-B Chimney Cleaning System and includes two additional 36" flexible rods. The Sooteater RCH205 Rotary Chimney Cleaning System cleans wood stove and fireplace flues. 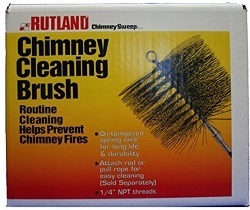 Spinning chimney whip removes dangerous soot and creosote buildup better than a brush. Helps prevent flue fires. Unique trim to fit design fits multiple flue sizes. Will work on round from 5 to 18-Inch in diameter; 12=Inch x 12-Inch square, rectangle or oval flues up to 8-Inch x 12-Inch. Won't scratch metal flues like a steel brush. Fits through tight areas. Fits on any drill and spins forward and reverse. Cleans from the bottom up without getting on a ladder so you can DIY and save money. 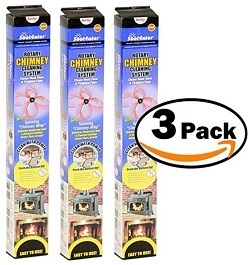 Includes (6) 3-Feet long flexible rods with reversible bottom link quick connect system. Removes dangerous soot and creosote buildup better than a brush. Assembled Length: 8.25 in. 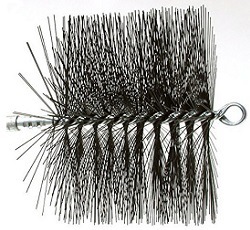 Color Family: Black Product Type: Chimney Brush Assembled Width: 8 in. 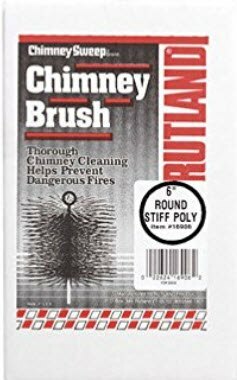 Brush Shape: Round Bristle Material: Polypropylene Assembly Required: No Application: Chimney Cleaning Kit Assembled Height: 10.5 in. Hardware Included: No Packaging Type: Box Designed for insulated metal chimneys, stainless steel or metal stove pipe where manufactures recommend not scratching the flue. Sturdy plastic brushes have 6" of fill and are acid resistant. Fittings are 1/4" threading. Designed for insulated metal chimneys, stainless steel or metal stove pipe where manufactures recommend not scratching the flue. Sturdy plastic brushes have 6" of fill and are acid resistant. Fittings are 1/4" threading.